Click the button below to add the Medium Communication POSTERS to your wish list. 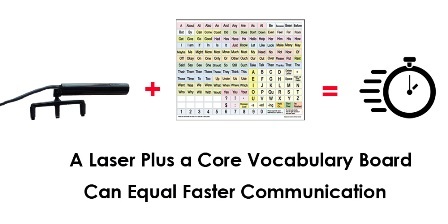 Our Medium size communication posters measure 11 x 17 inches and are designed to be used with a laser pointer. This is a paper poster which comes shipped rolled in a tube. We also offer a rigid communication board which is mounted onto a hard sheet of plastic. The words on these boards are core vocabulary words. Core vocabulary words are the most frequently words used words in the English language (little words like "the" "she" "want", etc.) They make up about 80% of our day to day conversation. It allows a person to construct a large part of their message word by word, rather than having to spell out every single letter. Note: The paper communication posters are not returnable. A short testimonial about using low tech communication by Dr. Richard Olney. Dr. Olney established the ALS Center at UCSF (University of California, San Francisco). Dr. Olney later developed ALS (Amyotrophic Lateral Sclerosis.) Dr. Olney uses a head mounted laser pointer and a communication board as his primary form of communication.